The keto diet offers an effective way to burn fat. When you follow this diet, your body begins to burn fat cells to produce energy, instead of relying on glucose. While the basic concept of the diet is easy to grasp, beginners may find it hard to get started. Determining how many grams of fat, carbs, and protein that you need to eat is a chore. You also need to plan your meals based on keto-friendly recipes. The following recipes for keto diet meal plans can help with your planning. Check out each of the recipes, and begin building your own meal plan by selecting breakfasts, lunches, dinners, and snacks for the entire week. You should never skip breakfast. In fact, you should ensure that you get plenty to eat in the morning. The food that you eat for breakfast fuels you through the day. Unfortunately, not everyone has time to prepare a fresh meal every morning. The following free keto diet recipes are perfect for quick and easy breakfasts. They are easy to prepare and should not get in the way of your standard morning routine. Review each of these breakfasts and begin building your meal plan. You should try to plan your meals one week at a time, as this makes it easier to organize your shopping list and avoid letting food spoil. You need several simple breakfast recipes so that you can prepare a healthy meal early in the morning without being late for work. This fried eggs and vegetable recipe does not require much prep work. You can even prepare the vegetables the day before. The recipe simply requires you to fry vegetables in coconut oil and then add the eggs. You can also add your favorite spices to give the dish a little kick. Ketogenic egg muffins only take a few minutes to prepare and about 20 minutes to bake. You can get the ingredients ready the evening before and have this ready first thing in the morning. It includes cooked bacon or salami. However, you can substitute this with ham or any other ingredient. Like an omelet, these muffins are versatile and can be used with a variety of ingredients baked into the egg mixture. Scrambled eggs should be easy to prepare. However, some people struggle to get the desired fluffiness from the eggs. If you want help making the perfect scrambled eggs, try the following recipe. With this recipe, you add sour cream, butter, onion, and bacon to the mix to help add flavor and texture. The sour cream and butter also add healthy fats that you need to get through the day. If you do not like eggs, there are many other breakfasts that you can choose, such as low-carb pancakes. With this recipe, you use coconut flour and baking powder to create the flour mixture for the pancakes. It really tastes like regular pancakes. You can even add low-carb maple syrup or a small amount of honey. Just remember to count the carbs from the toppings. After choosing several meals for breakfast, you should start searching for dinners. Keto-friendly dinner recipes are often based around meats, such as chicken, pork, fish, steak, and ground beef. These dinner recipes provide a good starting selection of keto meals for beginners. However, you should continue to find new recipes. If you keep eating the same meals every day, you will get bored of the food and may go back to your old eating habits. For now, start with a few of the following options, and then slowly build your own recipe list of favorite keto-friendly dinners. Cauliflower rice is a low-carb alternative to white or brown rice. It is made from shredded cauliflower, and it is an important part of this burrito bowl recipe. You combine the rice with a mixture of ground beef, jalapeno peppers, and avocado to create a cheesy Tex-Mex bowl. While the ingredient list is long, you can cut out some of the items, such as the garnish, if you want to simplify the recipe. Meatballs are a great choice for dinner. Unfortunately, traditional meatball recipes require flour to help hold everything together. This recipe solves that issue by using extra cheese to keep the meatballs from falling apart. Overall, the recipe is easy to prepare. Prep time is only about 20 minutes, and it takes 50 minutes to cook. Pork is often an inexpensive meat to purchase. However, some people stay away from it because pork is easy to overcook. When it cooks too long, the pork can become tough, chewy, and unappetizing. With this cranberry roast pork tenderloin recipe, anyone can prepare tasty pork. Each serving contains just five grams of net carbs. However, it also only contains five grams of fat, so you may need to find a fat-filled side dish to pair with this recipe. This next recipe is low-carb and gluten-free. You can easily whip this recipe together and bake it in just five to ten minutes. In fact, you can get everything ready the day before and throw it in the oven just before you want to eat. If you are cooking a meal for one, store the mixture in your fridge and just take enough out to prepare a handful of crab balls for your next meal. If you enjoy fish, you will love this lemon butter sauce recipe. You only need two ingredients and it takes just three minutes to make. You can pair it with almost any fish. You should consider making this butter sauce and then using it to freshen up leftovers. The lemon helps breathe new life into reheated fish or chicken. If you are a vegan, your dinners may be a little different. Many of the sources of fat and protein that the typical keto dieter eats are off the menu. Instead of meat, you may need to get protein from beans and nuts. Here are a couple of vegan options to help you get started. Tofu is a standard ingredient for vegans. It is how you get a lot of your protein. However, it is an acquired taste. This tofu in tomato sauce is an interesting way to spice up the fake meat. It includes diced tomatoes, chili flakes, and various herbs to help create the perfect low-carb vegan lunch. This recipe provides another way to prepare tofu. With the crispy peanut tofu and cauliflower rice stir-fry, you may forget that you are eating tofu. Before trying this recipe, you should know that it takes over an hour and a half to prepare this meal. You may need to set aside some extra time to make this tasty dish. Lasagna may not be the first meal that you think of when planning a vegan diet. You typically need lasagna noodles and a lot of cheese to prepare this dish. With this recipe, you use vegan noodles and macadamia nut cheese. The result is fantastic. You get a filling lasagna bake made with zucchini noodles. However, you can substitute the zucchini with sweet potatoes or eggplant. Kale and crispy tempeh are combined to create a stunning dish when you follow this simple recipe. While the long ingredient list may seem overwhelming, the recipe is easy to prepare. It uses kale leaves and green onions as a base for tasty coconut tempeh. When choosing lunches and snacks for your keto diet, you may have additional challenges compared to preparing breakfast or dinner. For example, if you work during the day, you may not have the opportunity to prepare a meal for lunch. It is also difficult to cook breakfast and then lunch before leaving for work. The lunches and snacks that you choose should require minimal prep time or cooking time. If possible, you should also look for recipes that you can prepare in advance or that allow you to complete most of the steps the day before. Lunch and snacks are also two areas where you can prepare cheap keto meals using leftovers from breakfast or dinner. With the following recipes, consider substituting the main meat ingredient with your leftovers. Finding lunch recipes is a challenge, especially when you work all day. You need to find something that you can bring to work and easily reheat. The following chicken enchilada bowl is a perfect choice. You can prepare the meal the day before, store it in a container, and quickly heat it up at work for lunch. You can also save money on this recipe by preparing the cauliflower rice yourself from fresh cauliflower. Tomato feta soup can warm you up on a cold day. It is a simple meal to make, as it just contains a few basic ingredients. You should be able to prepare it in just 30 minutes. It is also a good meal to prepare the day before and reheat at work. You can pour a serving into a microwavable bowl and heat it up for lunch. This recipe does not require you to use leftover meat. It is a simple egg salad recipe that includes avocado to help add beneficial fats to the meal. Egg salad is a great option for beginners, as you can prepare a big batch and then use it throughout the week. Even if you are cooking for one, you should consider doubling or tripling the recipe. All of the recipes discussed are suitable for the keto diet. However, you also need to pay attention to the total fat, carbs, and protein contained in each serving. Calculating your daily macros is an essential part of the ketogenic diet. Your serving sizes may be different from the next person. The typical keto dieter gets 70% of calories from fats, 20% from protein, and 10% from carbs. However, these ratios can vary. To determine your macros, you also need to know how many calories you should be eating each day. The average man needs to eat about 2,500 calories per day to maintain weight. The average woman needs to consume about 2,000 calories. One gram of fat provides nine calories, while one gram of carbohydrates or protein provides four calories. With these figures, the typical man would need to eat 195 grams of fat, 125 grams of protein, and 62 grams of carbs to stick to the keto diet. After calculating your macros, divide these totals by four to estimate how much fat, protein, and carbs you need with each meal. You should aim for one-quarter of the total per meal, leaving one-quarter for snacks throughout the day. With the previous example, you may have about 49 grams of fat, 31 grams of protein, and 15 grams of carbs per meal. 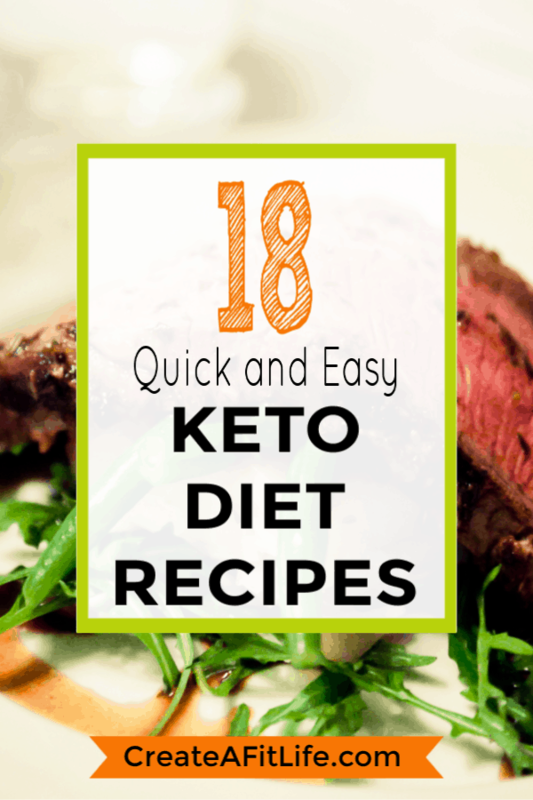 With the right keto diet recipes for beginners, sticking to the keto lifestyle is not too difficult. You just need to plan your meals. You need to ensure that you are getting enough fats and restricting your carbs. Without a plan, you are more likely to stray from the diet and force your body out of ketosis. The best way to start planning your meals is to choose your breakfasts and dinners. These are the two most important meals of the day, and they often provide extra food for lunch or snacks. You should also plan your meals for the entire week. You can buy everything that you need for the week and then take care of most of the prep in a single day. You will spend less time in the kitchen and less time worrying about your diet.